With a slew of products to test during the summer, it's inevitable that I'd encounter one or two that aren't up to snuff. These three all prove disappointing in some way, sadly. I'm posting them anyway because while they might have failed me and my very specific needs, they could very well work for you and become one of your beauty essentials. 1. JOICO Instant Refresh Dry Shampoo ($19.95) promises to refresh locks, absorb oil, and nourish strands with a high-tech cocktail of nutrients. While the dry shampoo does a good job of de-greasing my bangs, it also leaves behind noticeable white residue which is very hard to comb or brush away. This one's probably a better bet for light-haired gals. 2. Most mascaras don't fare well against my uber-oily eyelids, so I wasn't surprised when Givenchy Noir Couture 4 in 1 Waterproof Mascara ($35 at Sephora) started smudging around the mid-day mark. It's a shame because the innovative applicator does wonders for length and volume while allowing me to get at every lash. The formula also has a Lash Booster Expert Complex that fortifies lashes and helps them grow longer and stronger over time. Alas, the panda eyes. 3. 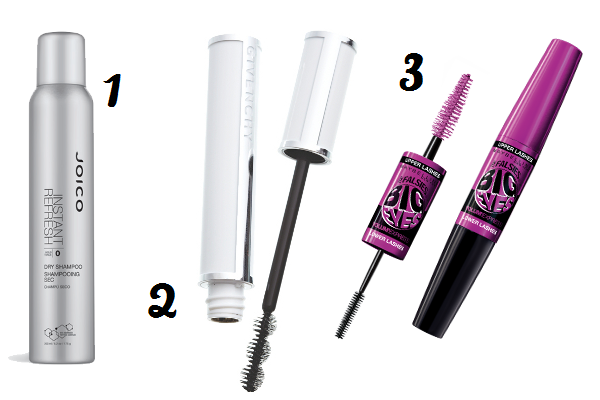 Maybelline's the Falsies Big Eyes Mascara ($10.99 at London Drugs) is earning raves for its different-sized applicators for upper and lower lashes, and the doll-eyed falsies effect it creates. I don't have enough lower lashes to truly appreciate the benefits of the teeny tiny brush, but the bigger brush does an effective job of volumizing and lengthening sans clumps. Sadly, Maybelline's formula is just as smudge-prone as Givenchy's and doesn't last long on me. If you don't have preternaturally oily eyelids though, this is a solid drugstore option. As for the Maybelline Big Eyes, it stays put fairly well for me, but I have actually thought that if my lids were a smidge oilier, it would be all over!